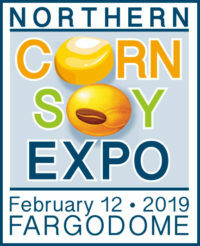 Mark your calendars for February 12, 2019 for the Northern Corn and Soybean Expo at the FargoDome. The event is a partnership between the ND Soybean Council and ND Corn Council. Check back later for more information about the event. The ND Corn Growers Association and ND Soybean Growers Association will also be holding a trade show during the event. Trade show information will be released soon. FargoDome, 1800 N. University Dr.